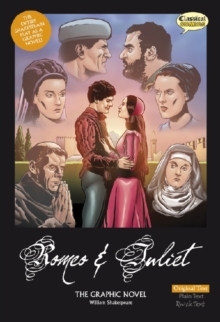 This is the full and unabridged play as a graphic novel! 'But soft, what light through yonder window breaks? It is the east and Juliet is the sun'! This title presents the tragic tale of doomed love, set in Verona, Italy, where the Montagues and the Capulets constantly feud and bring unrest to the city. So how could love possibly survive between this pair of star-crossed lovers, Romeo Montague and Juliet Capulet? Only Shakespeare could take such a romantic story and turn it into a soul-searching tragedy.